In the bag ready for his holidays. The health visitor came to visit on the Monday. Euan was sound asleep and so he was weighed with his clothes on - 10lb! Euan saw in the New Year in the traditional manner of being up all night! Thankfully we all managed a snooze before heading back to the farm for our dinner and to say cheerio to the visitors before they headed home. Not a very exciting week - a bit wet and windy - both inside and out. Daddy back to work after the Christmas break, so Mum and Euan left to thier own devices at home. Euan received a parcel of goodies from Rosie, including a lovely pair of sheepy slippers - fortunately too small for Mum to get on her feet. Yet another activity packed week in the life of a 7 week old baby - the activities being mainly feeding and sleeping. We had a word with Auntie Jennifer on Saturday to wish her a happy birthday. On Sunday we had our first family outing to the swimming pool. Euan thought it was ok but not as nearly as enjoyable as his bath at home. Weighed again this week 10lb 12oz. Some of the vests are struggling to fasten and the babygro's are at full stretch. We went to Belford at the weekend to see Granny Maureen and Grandad Jack. Euan treated them to his new talent for beaming smiles. Euan had his first immunisations - didn't like very much and made his displeasure known - LOUDLY!. He was also weighed(11lb 1oz) he is certainly growing well. Not much other news as gales, snow and rain curtailed any other activities. Eleven weeks old now, and getting bigger each day. Mummy doesn't need a gym subscription when she has a baby Euan to lift and carry. The weather has been slightly better this week so we have been out for a stroll a couple of times. Euan was disappointed not to receive any Valentines cards this week, but he's sure this will change since he is such a handsome young man. He has also developed enough coordination to get his thumb/finger/whole fist in his mouth - and keep them there - for a good sook. Mummy & Daddy are also delighted that Euan has sorted out nightime sleeping, clocking up his first eight hour sleep this week. The wet and windy weather curtailed our outdoor excursions this week, so Euan made the most of being indoors by stocking up on food, and practicing being cute! We popped down to visit everyone at the farm on Sunday. They all remarked on how much Euan had grown since the last time they had seen him. We managed to get out and about a bit more this week, including a family stroll to the craft shop at Errol Station for a cuppa and a sticky bun. Euan was well organised and sent a card to his Auntie Margaret for her birthday. She remarked on how good his handwriting was! Euan also managed to sneak off and buy a bunch of flowers for Mothers Day - how sweet!! Euan has had his second lot of immunisations this week. Definitely not impressed at being jabbed! He was weighed 11lb 8oz. He's burning up lots of calories so not a huge weight gain. Mum's going to have to turn on the gold top. Cornish cousins, Helen and Sarah came to visit on Thursday. Judging by the smiles and laughter, Euan thought that Sarah is the most hilarious person he has met! I think Helen enjoyed having a little "hands on" baby practice in preparation for her little bundle arriving in June. The day revolved around an outing to the swimming pool that everyone enjoyed. After all the excitement of last week we had a fairly quiet time this week. First pub visit on Saturday - too young for anything on offer, but at least Mum & Dad managed a bite to eat. We spent Euan's first Easter at Grannies at Belford, keeping her company whilst Jack was in hospital being fitted with a new hip. The cat went on his holidays to the farm to try to catch the mouse which had been terrorising Auntie Rosemary. However, his mission was unsuccessful and he was sent back to Errol. Daddy was on holiday for a couple of days at the start of the week, so Euan enjoyed having him to entertain during the day. Euan has now outgrown the Moses basket, so he moved into his cot this week. He looks very small in it, but it must be very comfortable as he is still sleeping well at night. Our apologies for not updating this more frequently, life revolves around the washing machine and food at the moment. The start of the month saw Euan having his third set of immunisations. He is pleased that there aren't any more jabs until Novemeber. Whilst at the baby clinic Euan was weighed - 12lb 13oz. The Spring-like weather has allowed us to get out and about a bit more....Euan enjoys a tour of the garden to see what is growing and to check on the progress of the tadpoles in the pond. We've even managed a few excursions on the bus to Perth and Dundee. Although feeding is still Euans favourite pastime, he has started to have fun rolling around on the floor and trying to grab hold of his interactive soft toy (a.k.a The Cat)...Rodney is not greatly impressed by this new development but is being quite tolerant - at the moment! Euan had a busy bank holiday weekend at the start of the month...his cousins Fay and Angus came to dinner, (with Auntie Rosemary and Uncle Brodie), so he had great fun entertaining them. On the Monday we popped down to Northumberland to see Granny Maureen. It was good to see Jack too this time, who is recovering well from his hip operation and has stopped smoking too....Well Done!! However, the highlight of the month so far has been meeting Grandad Peter and Flor for the first time. They are home from Thailand for a month, so we were pleased that they managed to come and stay to spend some time with Euan. We all went to the farm on the 24th to help out with a sponsored walk. It was a lovely sunny day and over £600 was raised for the Macmillan charity. ....Well. we've reached the end of May and a tooth has appeared....just in time to start munching on solid food! Euan's favourite 'new taste' so far has been sweet potato. Much better than the pureed pear which he clearly didn't like! Euan now has two teeth and is putting them to good use, munching his way through any new food we offer him. All of this eating is being converted to muscle, and a weigh-in at the start of the month tipped the scales at 16lb 3oz. Euan and Mum spent a few days down at Belford in the middle of the month. We managed to visit quite a few people and catch up with all the news. Dad and the cat enjoyed having the house to themselves and a bit of peace and quiet for a few days. Euan wasn't too interested in his first train journey back north - sleeping all the way from Dunbar to Leuchars!! We were all very excited to hear about the safe arrival of Euan's new cousin, Oliver (8lb 13oz) on the 22nd. Congratulations to Mummy Helen and Daddy Adam....We're looking forward to visiting Oliver next month. There was a little bit of a crisis towards the end of the month when the washing machine went on strike - a nappy disaster loomed, but with a visit from the repair man and a little TLC it has returned to work! At the end of the month we travelled up to Aberdeen to celebrate Auntie Jennifer and Uncle John's Ruby wedding anniversary. We took the surprise guest up with us - Shetland Granny. It was a lovely afternoon organised by cousin John and Diane, who were home from Australia. The lunch was wonderful, bagpipe music a treat and powerpoint presentation particularly entertaining! After dropping the cat off at the farm for his vacation, we headed off down to Cornwall. On the first day, we managed to get as far as Cheltenham. We were all pretty hungry, but only Euan got away with chewing the edge of the table whilst waiting for the food to arrive. We arrived at Auntie Margaret and Uncle Richards the next afternoon. After a little rest we headed off down the beach to watch the gigs being rowed and to try out the new baby carrier back pack. We visited the Eden Project, which was very interesting and a bit hot and humid - a trial run for visiting Grandad in Thailand perhaps?! Stithians Agricultural Show was our destination on the Monday. Euan seemed to enjoy seeing all of the animals on display. He did sample a Cornish pastie but it was a bit peppery for his taste. He was quite happy to stick to scones with jam and clotted cream. 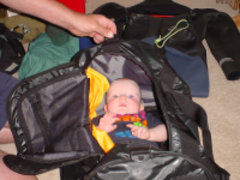 Daddy managed to fit in half a days windsurfing whilst Euan went off to the swimming pool with Mummy and Auntie Margaret. Great fun for everyone! Soon it was time to head back north - however we did stop in Manchester to see cousin Helen and baby Oliver - both looking great! We all went off to Perth Show on the 1st of the month. Lot's to see - Euan particularly enjoyed watching the tug-o-war competition. Granny Maureen came to visit for a few days. Unfortunately it rained most of the time whilst Granny was here but we did manage a visit to Dundee and Perth. Euan has now discovered he can pull himself upright holding on the various pieces of furniture - the cat is not happy with this latest development as he is no longer out of reach on the sofa! We have had to invest in a couple of gates to keep Euan contained in the lounge and out of the cat's food dish! We saw little Oliver again this month - He was on his holidays at the farm and enjoying all the attention from his cousins there. It was lovely to see Auntie Jennifer and Uncle John whilst we were there too. It was Mummy's birthday in the middle of the month - Euan seems to have inherited his Daddy's cheeky taste in birthday cards! He did also give Mummy a lovely bunch of flowers. Colette came to visit at the end of the month which was great fun. Euan loved having someone else to entertain with his antics. We did manage to stop Colette smuggling him back to Leeds to make up for her 'baby' going off to university in September! Granny Maureen and Jack came to visit for a few days at the start of the month. We all went off to the Dundee Food and Flower Festival at Camperdown Park. It was a lovely day out and Euan particularly enjoyed the free samples of cheese! Euan is becoming more confident about standing and moving around using the furniture for support, although he does resort to commando crawling when needing to get somewhere at speed! We went down to Belford at the end of the month to deliver Granny's birthday present. Mummy took the opportunity to enter a few classes at Belford Show - quite successful - a first for her carrot cake and a second for the lemon drizzle cake. Mummy and Daddy celebrated their wedding anniversary at the start of the month - 9 years! The next celebration was Daddy's birthday....It was 9 too if you add the two digits together. Euan bought him a book which will hopefully help with homework in a few years time. Granny Maureen came up to Perth for the day to meet Mummy and Euan. We had a lovely day with a relaxing lunch at the theatre. Mummy was lucky enough to win some tickets to the Good Food Show in Glasgow so we all went off there for a day out. Euan really enjoyed the opportunity of free food samples - munching his was through sausage, cheese, rice pudding, yogurt and shortbread - then still eating dinner when we arrived home. Euan decided he was still a little small for going out guizing on Halloween this year - prefering to stay at home and scare Mummy and Daddy instead! Big changes to Euans life this month as Mummy returned to work. He is now a member of the Teddy Bear Club nursery on a Monday and Friday, and enjoys the company of Karen, his childminder on a Tuesday, Wednesday and Thursday. He has the dubious distinction of being the 'best eater' in his group at nursery! Unfortunately, Euan and Mummy both had nasty colds at the start of the month which meant they were quite miserable but thankfully Daddy managed to avoid the germs and take care of them. We had fun celebrating Euans first birthday, although it certainly doesn't seem like a year since he was born. We had a little 'pre-birthday' celebration on Sunday 23rd which Uncle Brodie, Auntie Rosemary and cousins, Fay and Angus came to. Unfortunately, the snowy weather that day meant that Granny Maureen, Jack and Auntie Gillian didn't manage up from Belford. Euan enjoyed opening his presents and seemed to find ripping the wrapping paper particularly good fun. some relatives appear to be relishing giving Euan noisy toys....On his birthday, Karen organised a birthday party for Euan. He had great fun playing pass the parcel and even saved some birthday cake for Mum and Dad to have! Euan had his Hib and Men C booster jab at the start of the month, which was done without tears - a braver lad than Dad? Euan's social diary consisted of several Christmas parties and he was amazed to see Santa could spare the time to visit each one! He loved the opportunity to have a variety of finger foods at each one! We went off to Belford on Boxing Day to see Granny Maureen and Co for a couple of days. The cat had a brief vacation at the farm ...to eat some more turkey?! We had a quiet Hogmanay. Euan didn't stay up (thankfully) to see the New Year in, and Mummy and Daddy managed to stay awake until after midnight - just!